Baby steps will still get you up the stairs. It just takes a lot of concentration, looking back to see how far you’ve come, and looking up to the top to keep moving forward. They say the dead tell no tales…Obviously whoever coined that phrase never studied the bones of prehistoric animals, because the fossils of dead critters sure say a lot. Dry bones all kinda look the same, but take a closer look and you can see the clues left behind. Last Monday, we went through a basic rundown on how paleontologists can figure out how to put the bones together. How they take the bits and pieces they find in the field and build up the skeletons you see in museums. Now before we move on to the soft stuff I just want to make one thing clear. Unless it’s something totally new, most dinosaurs don’t have as much guesswork as I implied in my post. Take Allosaurus, for example. Tons of bones, from many different animals, gives us a good overall picture of the species and its growth cycle. So for many dinosaurs, the difference from one skeleton to another is pretty small for the average enthusiast like myself. And honestly, the skeletons of lions and tigers are almost identical. We wouldn’t have a clue how obviously different they are without everything on top of the bones. So what can bones tell us about an animal? A skull can tell us about how the animal sensed the world around it. The size and shape of its brain, how good its sense of smell, if it had binocular vision like we do…all that good stuff. The shape of the joints, and points of muscle attachment, can show us how the animal might’ve moved. It also gives us a basic silhouette to work with. Bumps on the forearm, called “quill knobs”, show where large feathers where attached. As well as other marks of soft tissue like where crests might attach. These are just a few things bones can tell us, and how can we know this? Take a close look the next time you eat a chicken drumstick or turkey leg. The bone is not perfectly smooth, and it has a very specific shape. There are ridges, bumps, little divets on one side…these are all marks where the muscles and tendons attached. The chicken drumstick is actually a great example, because the bones of birds and crocodilians can be a sort of Rosetta Stone for translating dino bones. Birds and crocs are the closest living relatives of dinosaurs, and birds are now classified as a group within dinosauria. Long story short, the bones of living relatives like birds and crocs are a good starting point for figuring out dinosaur anatomy. Not perfect, since crocs aren’t dinos, and modern birds fit into a specific niche inside the huge and diverse group of animals we call dinosaurs. But crocs and birds can help fill in a few places that we would otherwise be clueless about. How much muscle? Crocs and birds have a different structure to their muscles than mammals. So we know the shape and size of the critter’s brain, but what does that mean? Crocs and birds today can give us clues. Other soft bits like organs, and how dinos metabolisms worked…looking at birds and crocs can help figure out mysteries in the bones, like how dinosaurs got so big. But now we’re heading into squishier territory than even muscles. Bones are pretty solid (for the most part). Muscles and soft tissue directly attached to the bone is just a matter of translating the markings correctly…but next Monday we’ll dip our toes into the mud and find out how much we know, or don’t know, about the soft outsides. Quick Question: Take a moment to notice all the little bumps, ridges, and dimples in this skull. Notice that triangular dip at the back of the lower jaw, and the high ridges that make that triangle shape. Powerful muscles to close the jaw attach here and go through that “loop”, where they attach to the back of the neck and head. This is one powerful critter! Can you guess what it is? Tigger sure has a big appetite. He’ll eat anything that fits in that giant mouth of his. Don’t mind the teeth though, because he’s just a big softie. Speaking of teeth, I’ve made a few changes to his smile. I’d originally chosen Liopleurodon, the marine predator famous in Walking With Dinosaurs, as the critter for Tigger. But I decided to change it to Pliosaurus for a few reasons. Pliosaurus doesn’t seem to be as well represented as Liopleurodon, probably because of Walking With Dinosaurs. What’s the difference between this picture and the last one? I’m glad you asked, because here’s where I get to geek out on you. 😀 But first, a quick disclaimer. Pliosaurus skull diagram, note the smooth, sloping forehead & shape of the lower mandible. I found this picture by searching the web, but don’t know who to credit. Any help there would be great, because I want to give proper credit to whoever illustrated this helpful diagram. the shape of the mandible, the bottom jaw. the size and arrangement of the teeth. It truly is humbling (and awesome!) to know that I get visitors all the way from Spain and Indonesia. I have no idea who came from where of course, so there’s no way I’d ever know where you live unless you wanted to share your address with me. It’s just cool to see the little map and which countries are colored in. 😀 Isn’t technology amazing? Thank you for taking the time to read. Life is busy and time is irreplaceable, so I hope I’ve done what I can to make your stay enjoyable. A six-year-old walks down the hall, eyes wide as he stares open mouthed at the skeletons towering high above him. Dagger teeth, gleaming claws, curving necks and long, sweeping tails…It’s almost surreal how the bones are suspended in the air, as if the skin around them was just invisible. Of course, now I know about the armature of steel. How each bone has it’s own pocket to nestle in. If one bone needs cleaning or repairs, then there’s no need to take down the whole skeleton. But how do we know what the skeletons looked like? But kid’s books and movies always show the whole dinosaur under some random hill. It’s gotten downright ridiculous, so that Bob the Builder and his team can dig into a hill, find a complete skeleton of a brontosaurus “standing” in the dirt, and then simply leave it there to be the entrance to their dinosaur themed amusement park. Truth is, building the complete skeleton is only the first part of figuring out just what these critters looked like. No idea how many pieces there are supposed to be, just that there should be at least oh, 2,000 or so…right? Just how many bones does your average dino have anyway? Luckily, bones can tell you a lot, especially teeth. An expert can tell you these are sauropod bones. Even better, an expert can tell you these belong in the family brachiosauridae . Now here comes the fun part…putting the puzzle together. You look at all the other fossils in the family. Maybe there are more of the same “genus”, brachiosaurus. Maybe these bones are enough to tell which species of brachiosaurus you’re looking at, and you can look at those for reference. And so on and so forth until you and your colleagues have determined what a complete skeleton of your brachiosaur might look like. Long story short- except in very few cases where paleontologists discover an articulated skeleton, like the lovely dilophosaurus here- then most skeletal reconstructions have at least a few missing parts, which are then filled in by educated guesses based on closely related animals. Now that you have all the pieces, how do they fit together? Knowing where all the pieces go relies on reference to other skeletons, research, and a great deal of know-how on the bones themselves. Bones can tell us a lot, because the soft and squishy bits that hold them together leave scars. Knowing how to interpret these scars is where dry bones get interesting, because this is the beginning of figuring out how the animal looked in life. Next post we’ll talk about muscles, tendons, and all the soft stuff under the skin that we don’t usually see in the museum. I made some changes to the about page. 🙂 Check it out! Goal for next week. Really work on getting a buffer. I have a tiny buffer, but it’d be great to work on getting a month’s worth. This means I can breathe a little easier (because being prepared is awesome), and I can focus a little more time on the picture book! It’s also great to have a buffer when the week doesn’t work so smoothly. Can’t always count on nap time working in my favor, and there’s been more than a few posts written in a rush before the deadline. I know there are a few “mom-preneurs” out there who wake up at 5 am to get stuff done, but I don’t work that way. My 20 minute power nap is essential to the quality of my posts (and the sanity of everyone within a 5 mile radius of me)! Life is full of everyday miracles. The sort of things that are so unlikely to happen, it’s amazing they happen at all. Take fossils for example. Let’s start with something big- a sauropod, or long-necked dinosaur. Should be easy to fossilize right? Unfortunately we need a dead one for our fossil, so let’s skip the sad story. Let’s just say an old brachiosaurus (Let’s call him old Mr. B) came to the riverbank for one last drink of water…Now we have a very large feast for scavengers all up and down the riverbank. They won’t have to worry about hunting for months! Well, maybe weeks, depending on how many critters are joining the buffet. Mr. B is not going to stay in one piece. A leg over here…head gone…a chunk of tail in the belly of another…By the time the scavengers are done picking the bones clean, bits and pieces are going to be scattered and broken all over the riverbank. That pile of bones bleaches in the sun for a few more months. The bones dry out and turn brittle. Insects and small, nocturnal mammals with ever-growing teeth gnaw on them. The skies turn dark, storm clouds gather, and a week of constant rain raises the river. More rain from the north rushes in, and in a few short hours, flood waters pour in strong enough to uproot trees and toss huge rocks as easily as pebbles. On and on, the skeleton is fragmented by the force of the water. Silt- dirt and debris carried by the current- covers the bones. Over time, enough layers of silt build up and are flattened by the layers above them. Water, pressure, and time cement the layers of silt into sedimentary rock like sandstone and mudstone. Water seeps down through the rock. Bone is porous, and so water can seep through it. The water leaves mineral deposits behind, like the hard water deposits that build up in the dishwasher. Like a sponge drenched in salt water and left to dry in the sun, the bones slowly harden like solid rock. But that’s not all. It’s not enough to be fossilized. The rock needs to stay intact. The earth is constantly moving. Rocks that hold fossils can be pushed down and melted in Earth’s liquid mantle. Or pushed up into mountains, only to be erased by wind and rain. Even when the fossil is found, it can be lost, destroyed, or stolen. My point here is, it’s amazing we have any fossils at all! More amazing still, the exquisite beauty of fossils like the Lagerstatten of Germany and places like it. Just look at the archaeopteryx at the top of the paragraph here (those feathers are so perfect, they look better than my chickens’ feathers!). I am truly humbled to think about the beauty of the world around us, of humanity, of life. That it’s possible to see remnants of creatures gone for millions of years. That we can even dream of what they might have looked like. I look at a fossil like this, and I see a miracle. And then I look at the world today, see the people in my life…or even just take a moment to watch my hands and the way they move as I type these words…the complexity behind the mechanics of their movement. Nessie loves hide & seek, especially seeking. Better watch out, because she’ll sneak up on you from below. She’s really good at that. It’s hard to see in the picture here, but her eyes are almost on top of her head and point upwards a lot. It’s kinda funny, because I made the mistake of doing more research while I was coloring her, and ended up making changes! Notice all those little bumps and wrinkles in line of her spine there? And that little line that marks her jaw line at the back of the skull? Turns out that what I thought was a beefy, well fed Nessie, was actually 2 weeks from starvation. No kidding. The article I read compared two pictures of orca whales beside each other. One starving, the other healthy. The healthy one had a perfectly smooth torpedo shape. The starving one had a defined spine and faint lines defining the shape of the skull. I didn’t even know whales could get that skinny! But apparently they do, and when they do, it doesn’t end well. But I’m not sharing random sad stories. My point is, that this whale showed the same marks as my Nessie. And she’s a marine critter perfectly adapted for life in the open water. It’s reasonable to think she’d have similar adaptations. Thick layers of insulating fat to keep her warm. 🙂 And less wrinkly, because that just makes it harder to glide through the water. Essential for predators. This week I have a special goal to update the about page. 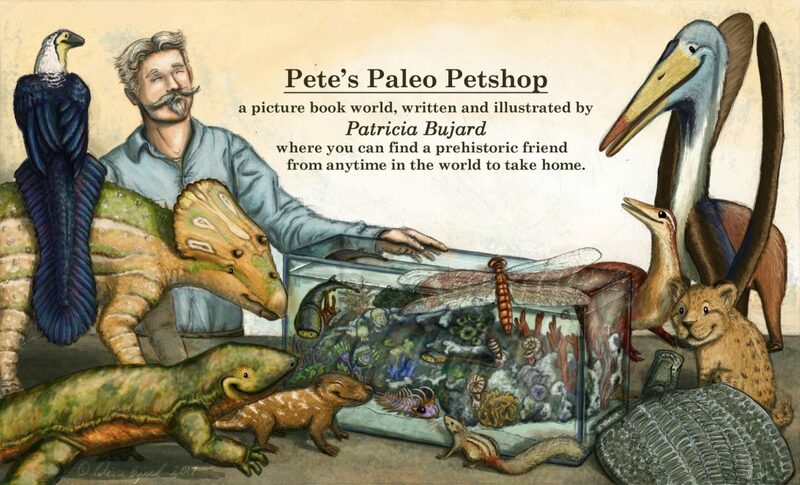 At the moment it’s too much about me, and not too clear what Pete’s Paleo Petshop means for you. I love what I’m doing, but ultimately I want it to be for you, and not make it all about me. This quiet softie loves nothing more than to spend time with his special person. I really love my country, and everything the founding fathers worked so hard to cultivate in the early years. So here we have some American dinosaurs to help us celebrate. Steggy the Stegosaurus. A little more red than usual from all the excitement. Alfred the Allosaurus. He’s ready for the water-balloon toss. Picasso the Dilophosaurus. Not so tiny as the one in Jurassic Park huh? Skittles the Scutellosaurus. She’ll probably go hide in the bathroom when the fireworks are going off.